Open the text message and then press the “Home” and “Sleep/Wake” buttons at the same time. Then tap on the share button on the edit page of the screenshot and click on “Print” to use AirPrint; or you can email to yourself and print it on computer. But this method may not be suitable for long message threads or bulk actions. Open the message thread that you want to print, and tap “Edit” to select all of the messages, then copy-paste them into an email. You can email it to yourself for printing, but you will lose all the date/time information. If you want to print out several threads or all your messages for backup or for court as evidence, no doubt the two methods mentioned above will be clumsy. 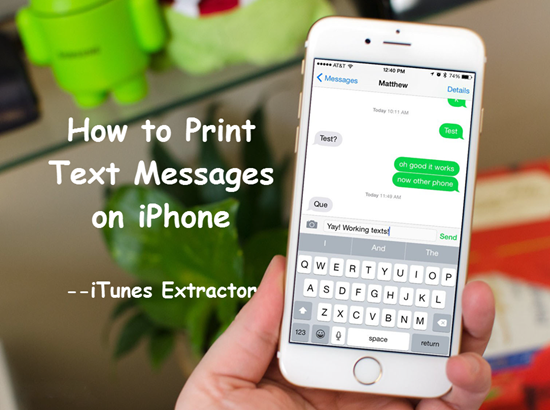 So to save your time and increase efficiency, here we introduce another way for you to print text messages from iPhone all at once easily. If you want to not only print a complete text message conversion from your iPhone, but also keep the date/time information, you can make use of third-party applications to accomplish this. Such program as iTunes Backup Extractor detects every iTunes backup file for iPhone X, 8, 7, SE, 6s, 6s Plus, 6, 6 Plus, 5s, 5, 4s, etc. on your computer, and allows you to extract text messages from the backup for printing even if you accidentally deleted the messages from your iOS device. To get started, you must have an iTunes backup with the latest iTunes installed on your computer. If you don’t have any backup, connect your iPhone to the computer and create a backup with iTunes. If you have recently synced iPhone to iTunes, you don’t need to connect the device; just jump into the following steps directly. 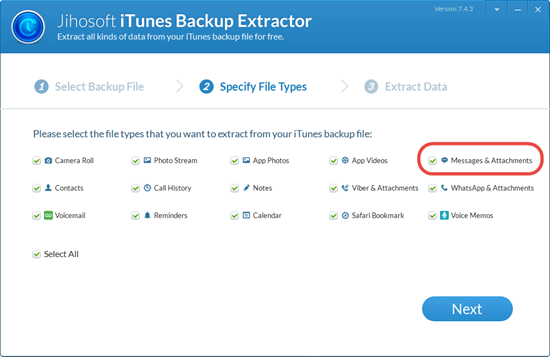 Once you install this iPhone backup extractor tool on computer, you can freely view the data in your iTunes backup and print iPhone text messages easily by following the 4 steps below. Step 1. Run the iPhone SMS Backup Extractor on your computer and select the iTunes backup file of your iPhone; click Next. Step 2. Select “Messages” from the listed file types and click “Next” to scan for text messages in the backup. Step 3. Preview and elect the messages you need, then click “Recover” to export the messages to your computer as HTML. Step 4. Open the HTML file on your browser and click on the “Print” button to print iPhone text messages. That’s all about how to print text messages from iPhone with the help of the third-party tool. 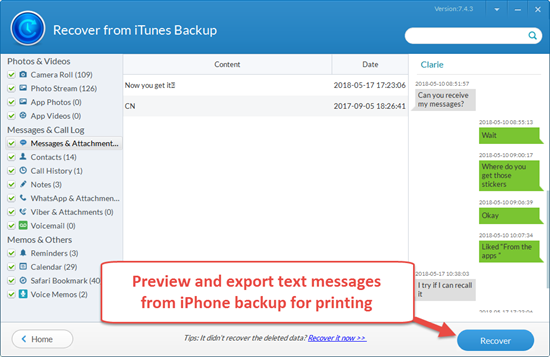 Besides printing messages, this method also can be used to recover the backed-up messages deleted from your iPhone. As you can see in the interface, this iPhone backup extractor tool can also help you get data like contacts, photos, videos, WhatsApp/Viber chats from iTunes backup. If you have any questions or problems, please feel free to contact us via support@jihosoft.com.